As far as cap collectors are concerned, the only name in fitted hats is New Era. The company has literally produced 99% of coveted collections, all over the world. It's more than something to be a fan of, it's become it's own culture; some would even go as far as claiming it as borderline religion. For most, it's something we have only followed, admired, collected, and adored from a safe distance. For others, such as the CrewEra13 group, it is a tangible, yet temporary experience of what it is like to be immersed in the brand, itself. However, even fewer get to live it, on a daily basis. Today, we find out what it's like to manage the only New Era Flagship store, North of the U.S. border. This is Adam Gordon. TFD: Clearly, you have a love for the fitted culture. When did you first start collecting? AG: I've never really looked at myself as a collector, but someone with a passion for fitted caps. If I was to put a date on it though, it would be around 2001. TFD: What size cap do you personally wear? TFD: How many caps do you currently have? AG: I haven't really taken an accurate count of my caps. I have a lot compared to the normal man/woman, but nothing like the guys from CrewEra13. TFD: What professional teams do you tend to root for? AG: The Baltimore Ravens, Toronto Blue Jays, Toronto Maple Leafs, and the Toronto Raptors. TFD: Are there any specific "rules" you have, when it comes to what makes your collection? AG: I feel everyone has their thing. I'm someone who likes basic, but unique. So, I can go anywhere from a basic on-field, to a custom color-way that expresses my style. 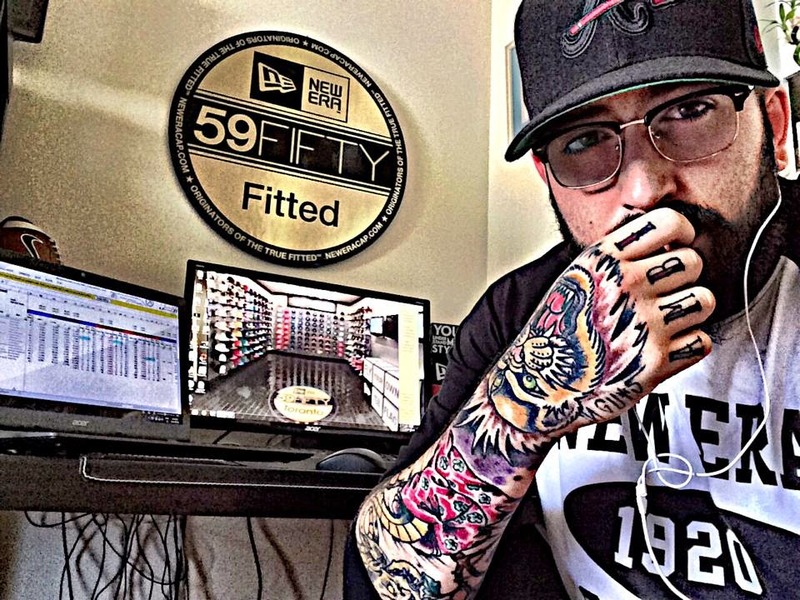 TFD: As some know, you are, in fact, the manager of the New Era Toronto Flagship store. When did that opportunity present itself? AG: As a kid, I had a few shops that I always looked at as my dream jobs; West49, EB Games, Lids, and New Era Toronto. Two years ago, an opportunity to work at a local Lids store came up. I didn't really know anything about retail, but the passion I felt towards the culture was so strong, it pushed me to learn all I could inside and outside of the workplace; I never gave up. Four months ago, the opportunity to work at New Era Toronto landed in my lap. Although it looks like I've become successful at landing my dream job, the passion is still burning, as I've set new, bigger goals for the future. TFD: To most, that sounds like an absolute dream job. What has been the best part about working there? AG: I'd have to say the people I get to talk to, everyday; getting to know the people who make this culture what it is, today. Not only the customers, but the people who work behind the scenes to make sure we have the best and hottest product in the store at all times. TFD: What is your favorite New Era Cap of all time; something you would claim to be a "must have"? 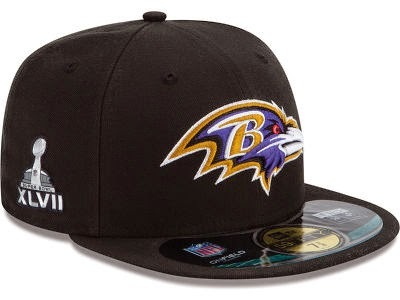 AG: Well, a must have in my collection would be the Baltimore Ravens Super Bowl cap. Also, the 1992 Toronto Blue Jays World Series cap; very simple, but it's something I'll forever have in my collection. TFD: What has been your favorite collaboration that you have seen New Era put together? AG: New Era's collaboration with Play Cloths, Billionaire Boys Club, and Kid Robot have been some of my favorites. TFD: Is there any company you wish New Era would collaborate with, that they haven't worked with, yet? AG: I can't really think of anything off the top of my head. I'm pretty satisfied with everything New Era has been doing. TFD: Being the only Canadian-based New Era franchise, you feature the Canadian Football League (CFL) caps, which are rather scarce in the United States. Do you get many requests for those products? AG: LOL! Yeah, from You! A few people have shown some interest in them, but our store is four floors high. We've got a ton of product that catches people's eyes. 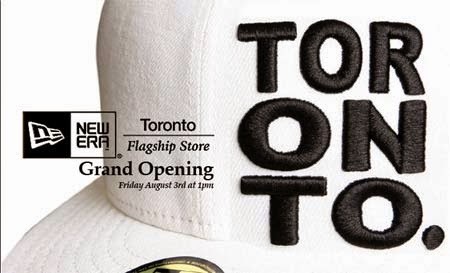 TFD: Who has been your favorite client of New Era Toronto? AG: Favorite or most frequent? Ha! James Hummel (@disneynorth) is definitely one of my favorite people to come into my store; he's in on a weekly basis. His passion for not only New Era Caps, but the Team Fitted world is insane. Shoutout to @neweraking2121 and @mitchell_21, as well, even though @mitchell_21 is a Pittsburgh Steelers fan. TFD: You're a man of many tattoos. Do you have any devoted to the fitted? AG: Haha. I have not committed to the fitted in that way, as of yet. You never know; could come soon! TFD: If any of our readers would like to follow you, via social media, where can they find you? In closing to this week's post, I just wanted to thank Adam, for taking time out of his busy schedule to take part in this. It's not every day you get the chance to chat with someone as close to the product, as he is. Definitely give him a follow through those social media platforms.